Contract Documents: incomplete, poorly coordinated, “design as you go”, and defective contract documents. Do the structural contract plans meet industry standards (AISC-AWS-RCSC) and steel industry standards of care? Scope Changes: increased scope of work due to design changes and revisions. RFI Issues: slow Request for Information (RFI) responses. Shop Drawing: slow shop drawing approval or significant shop drawing approval changes. Down Time: down time, inefficiencies and lost productivity issues in fabrication shop. Schedule: stacking of trade and schedule acceleration issues. Overtime: prolonged overtime labor requirements or “over manpower” requests. Materials: significant quantity variation from original as bid estimates. Work Stoppages: cancellation or suspension of the work issues. Scope Complexity: scope of work complexity issues. Out of sequence steel deliveries impacting steel erection in field. The value of professional construction claim preparation and analysis from an expert construction consultant is more than just monetary. Ideally, all parties will document key details of the agreement as a basic risk-management technique. But too often, documentation takes a back seat to the actual work—that is, until inevitable changes arise and the financial reality of the project sets in. This is the time when costly, construction delay claims are filed. Professional construction advisory services that deal specifically with claim analysis and preparation can help ensure proper submission of claims, investigation, and analysis to minimize the financial and logistical impact of the claim as well as the burden to the contractor, subcontractor, and/or owner. With extensive industry experience, construction expert witness experience and construction claim analysis experience, Mr. Charles can help you prepare, analyze, and settle claims quickly and fairly. 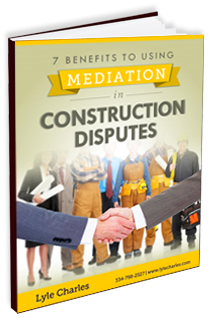 Contact construction claims expert Lyle Charles for more information about handling a claim. Mr. Charles also offers construction mediation and structural steel expert services. If you’re looking for a construction claims expert, call Lyle Charles today at (334) 798-2527.